Usaka Koji became famous for his ‘Akae’ fine red illustrations and the organic structures in his works. 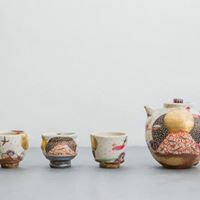 Moving between his base in Hakodate, his wood fired kiln in Kagawa and occasionally going back to Tochigi where he opened his first studio, he has continued to make a name for himself, most notably with his striking Mt. Fuji patterns. This month, Waka Artisans has the immense honour of hosting his first exhibition in Hong Kong. Usaka’s unique and quirky designs make each and every one of his pieces charismatic and unique. As a result, no matter where in the world you happen to come across his works, each one is instantly recognisable and should be cherished.